This interview took place on: 4/15/14. JFH (Mark D. Geil): There's a strong theme running throughout the new album, encouraging believers to commit to their faith with totality. Was that theme intentional? Mike Grayson: This is the first record that I've had a theme in mind from the beginning. On the last two, we wrote a bunch of songs and looked at them to find a theme after the fact. For this one, "All or Nothing" was the first song that I wrote, and I knew from the very beginning that I wanted it to be a very bold statement. I wondered, "is this a little too bold?" But as I got into it I was like, "No! That is the statement." I feel a calling to be part of a movement, a generation that's willing to stand up and almost militantly say, "I figured it out. It's Jesus. I'm ready, I'm sold out, I'm all in." The word "all" is in multiple titles on this record. I wanted to make it very clear what side of that phrase - all or nothing - that we were on. And it leads up to the last song on the record, "All to Jesus (I Surrender All)". When it's all said and done, at the end of the day, this is what I want my prayer to be. JFH (Mark): I don't how many people listen to albums straight through anymore, but I love the way this one ends with an exclamation point that is somehow also almost a little bit thoughtful and contemplative. Mike: I wish people did listen all the way through! I still make records as if someone was listening through the whole thing. If nothing else, it's for me. JFH (Mark): Well, I do, even if no one else does. You've gotten married since the last project. Has this period of transition matured your songwriting or changed your outlook? Mike: It has, for sure. As a writer, I'm always more drawn to the hardships in life, I think, which sounds funny. Songs like "Let the Waters Rise" and "Someone Worth Dying For," and even on this record a song called "People Like Me;" I tend to be emotionally drawn to those kinds of songs. But since I've been married, I found on this record there are a lot of happy songs. Songs like "Loved by You," "Everything You Say," "This is Our Moment." I don't naturally write up-tempo songs, but I definitely think being married has brought a different perspective. I think you can hear that in a lot of the songs on this record. JFH (Mark): The sound is bright. I love the gang vocals on a few of the songs and the melodic keys. It sounded like it was fun to record. Is that true? Mike: Absolutely. This is definitely a record we knew we wanted to be a little more organic than our last record, and we wanted it to have that joyful vibe to it. This record was different than any other process. It was a blast to create. JFH (Mark): You mentioned "This is Our Moment." That's a really big, powerful anthem. Have you been able to play that live yet? Mike: "This is Our Moment" is one of my favorites in general. I love the epicness of that song. I actually wrote it during the Summer Olympics a couple of years ago. Every time I play that song now, I think of the Olympics. The percussive element, the drums. We're on the road now with Aaron Shust, and that song every night is a blast to play live. People really connect with it. JFH (Mark): You had Lecrae in for a collaboration on the first record. You have Matthew West on this one. How did those pairings come about? Mike: You can hear it in this record with the gang vocals - I love for the songs to feel like, "Hey, we're in this together." The Lecrae thing was amazing. We toured with him before anyone in CCM knew who he was. We had a song, "Keep Changing the World," that was going to radio, and I thought, "man, this song just lends itself to having a rapper on it." He was awesome and excited to do it, and really took that song to another level. On this record, once I wrote "People Like Me," I knew I wanted it to be a duet, seemingly two different stories. It's a song I wrote for my family, our testimony in dealing with addiction for generations at this point. We were out on the road with Matthew at the time and he's just been an awesome support of what we do. I asked him if he would join me on the song and he was stoked to do it. Again, I think it takes the song to another level. For me, music is more fun with people than just by myself, so any opportunity I've got to collaborate and involve other people, I love that. JFH (Mark): I'm sure you've heard this. There is a common criticism of CCM music and certain other genres, that successful radio songs are generic. They all sound the same, you have to fit the formula of radio, and songs lose their identity. What do you do - given the huge radio success you've had - to make sure your music stands apart but still accessible to people and something that will get a broad audience? Mike: It's always a moving target for me. What I always try to do is, literally as soon as I put out a record, I start writing for the next one. I've almost written half of a new record already and this one just came out. The reason I do that is that's the time when I can write and there's no pressure. There's no radio person telling me we need a single or a label saying we're missing things. I get to write songs that I enjoy and I want to write. Those are always the songs that tend to make a record and become a single. I love that because it feels so much more natural to me and the band. I've found that most of the songs that become radio hits are songs that I never would've thought would become a single to begin with. "Let the Waters Rise" was one of those. I really love the song and I knew that it connected with people, but I didn't personally see that as a big radio song, and that's been our biggest single yet. JFH (Mark): Radio is so often all about testing and giving people a 10-second shot at a song to decide if it's going to float or not. That must be terribly painful for a songwriter. Mike: Oh, it's miserable! It's funny for me because most of the songs that have tested "through the roof" usually never perform as well as the songs that seem to be a struggle to get on the radio. I have to write songs that are honest to me. I just want to make sure that if there's a song on the radio that has my name on it that it's something that I actually want to hear. I'm pretty tough on myself when it comes to that. JFH (Mark): Last question. I wasn't sure I was going to ask because you're probably asked all the time, but where's the chair now? I have to know. Mike: The chair is in my house in Nashville. Everyone wants us to bring it on the road but it's this rinky-dink wooden fold up chair that would totally fall apart if we took it anywhere. I just keep it here in Nashville and it's probably going to stay here forever. JFH (Mark): Did you move when you got married? Mike: Yes, it survived the move, it's still in one piece as of today. JFH (Mark): You need to take out an insurance policy on the chair. Mike: If it was worth anything I would! Actually, if it was worth anything I would sell it. JFH (Mark): You're not too emotionally attached to it after all. Ladies and gentlemen, Mike is willing to let the chair go for a good price! Mike: Yes, put that in there! 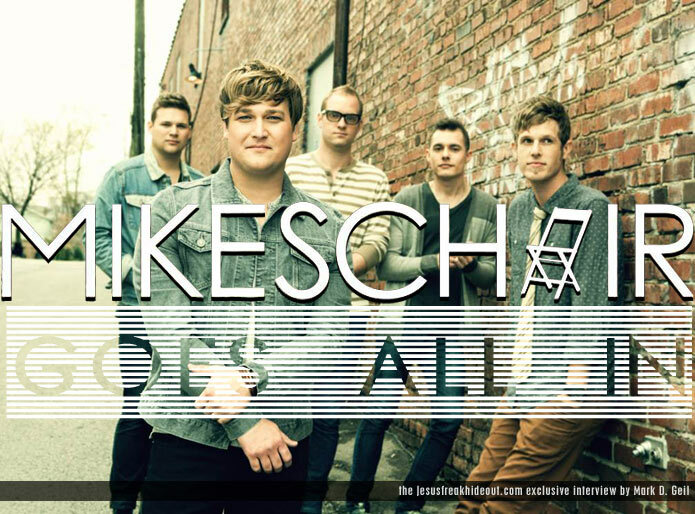 MIKESCHAIR's latest album, All or Nothing is available now at all digital retailers and exclusively at Family Christian Stores!